Minutes from the March 2018 meetings of the Eaton Bray Parish Council. Below is a summary of the minutes of the Eaton Bray Parish Council Meeting of 5th March 2018. Eaton Park Development: Cllr Janes has not heard back yet on this planning matter and will update accordingly. Consultation: Changes to bin collections - please note deadline for response/comment is 20th April 2018. Consultation: Local Plan - currently going through due process, completion expected end of April 2018. Motorcross: the Council to obtain clarification on hours of use/opening and report CBC's response once received. Reporting of crimes - Once again the police and Council wished to remind all residents to call the police, when encountering an incident/see something suspicious, at any time of day. Trying to obtain as much detail as possible to aid the police in their investigations. Concerns were raised by residents regarding the proposals by the Council to make a seating area in the small section at the bottom of the park. The Council clarified their position regarding the recent work carried out in this section of the recreation ground. In relation to benches, the Council took on board the concerns raised with regards to seating and the effects of such, however confirmed that they would be still be proceeding with the completion of phase 1 (which includes two of the trees being carved), however would reassess phase 2 (additional carvings/seating) at a later date. Concerns were raised with the amount of fly tipping in the parish. The Council confirmed that fly tipping on public land needs to be reported to CBC for clearance, otherwise the land owners are responsible for the clearance. The parish owns a piece of land in Bower Lane, which currently is very overgrown and unused. 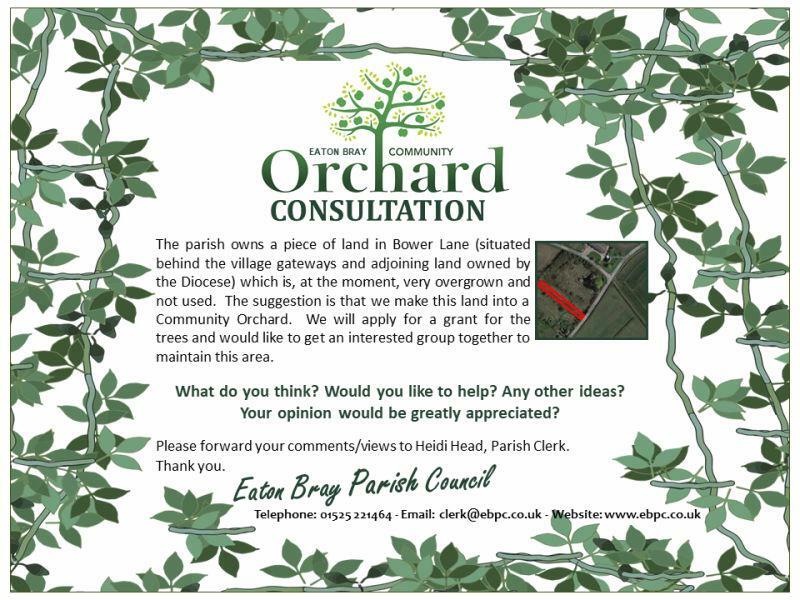 The Council is looking into the option of a Community Orchard and would like your views/help. An assessment on a section of damaged river bank in Mill End Close carried out at the end of last year showed there were three areas within the bank where water was leaking into the drainage ditch. The cause of the leak was from crayfish burrowing into the riverbank and damaging the structure. Work is planned to be carried out on this section of the bank and the Parish Council has contacted the Drainage Board for confirmation of when this work is due to commence, once notification has been received notices will be put on parish notice boards, Facebook and Focus. Monday 9th April 2018, from 7.30pm, in the Coffee Tavern (1st floor). You are reading March 2018 Parish Council Minutes.